Completed final high school examination at Friedrich-Schiller-Gymnasium in Ludwigsburg in 1972; studied physics at Ludwig-Maximilians Universität in Munich, and at Ruprecht-Karls-Universität in Heidelberg, from 1976 to 1982. He received his doctorate at the Institute for Environmental Physics of Heidelberg Universität, in 1985. Gerhard Thiele served with the navy of the German Federal Armed Forces from 1972 to 1976 as operations/weapons officer aboard fast patrol boats. While completing his doctoral thesis, Gerhard Thiele was a research assistant at the Institut für Umweltphysik (Institute for Environmental Physics), Universität of Heidelberg. He then completed post-doctoral research at Princeton University from 1986 to 1987. His main interests in research activities focused on global ocean circulation and its implications on climate development. He has authored and co-authored publications in the field of geophysics and oceanography as well as psychology. In 1988, Gerhard Thiele began basic astronaut training at DLR (German Aerospace Research Establishment). Upon completion in 1990, he was assigned to the German D-2 Spacelab Mission. In 1992, he reported to the Johnson Space Center where he trained with the crew as back-up payload specialist. During the STS-55/Spacelab D-2 Mission (April 26 to May 06, 1993), Gerhard Thiele served as alternate payload specialist in the Payload Operations Control Center of DLR at Oberpfaffenhofen. In 1994, he served with the Strategic Planning Group for the Program Director of DLR. Since 1994 he has served as an active member for the International Academy of Astronautics Subcommittee on Lunar Development. In 1995, he was assigned to head the Crew Training Center (CTC) at DLR in Cologne. 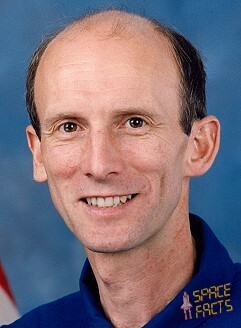 In July 1996, DARA (German Space Agency) and DLR (German Aerospace Research Establishment) selected Gerhard Thiele to attend NASA's mission specialist class 96 at the NASA Johnson Space Center (JSC) in Houston, Texas, where he qualified, after two years of training and evaluation, for flight assignment as a mission specialist. He was initially assigned technical duties in the Astronaut Office Computer Support Branch and led the development of a new class of computer based training courses. He was from 61 European candidates for the ESA 1991 selection one of five German candidates (and on the shortlist of 25 candidate applicants), but not selected then. In August 1998, he joined the European Astronaut Corps of the European Space Agency, whose homebase is the European Astronaut Centre in Cologne, Germany. Following his flight in February 2000, Gerhard Thiele was assigned by NASA for collateral duties as a CapCOM, the interface in charge of communications, between the Control Center and the Space Shuttle crew. This was the first time that this position had been assigned to a European astronaut. Since August 2001, Gerhard Thiele served as Head of the ESA astronauts and Operations Unit at EAC in Cologne and from August 2002 until April 2003 he became acting Head of the Astronaut Division. In January 2003, Gerhard Thiele was assigned as backup of André Kuipers for the Soyuz TMA-4 mission. He started training at Yuri A. Gagarin Cosmonaut Training Centre GCTC (Star City) near Moscow in May 2003 and returned to EAC in May 2004. From August 2005 until March 2010, Gerhard Thiele was assigned as the Head of the Astronaut Division of the European Astronaut Centre (EAC). As from April 01, 2010 Gerhard Thiele became Resident Fellow with the European Space Policy Institute in Vienna, Austria. Recreational interests include cooking, music, reading and sports, especially badminton. He enjoys his profession, and spending time with his family.